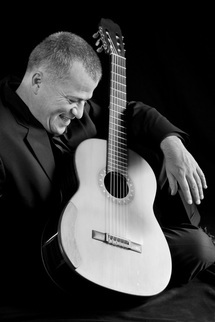 English-born composer and international concert guitarist Ross Thompson (b. 1967) spent his childhood in Puerto Rico before moving with his family to the United States. Mr. Thompson has been invited by a number of international festivals and schools to perform including the International Festival of Contemporary Classical Music (Lima, Peru FIMCCL), Leo Kestenberg Musikschule Berlin TempelhofSchöneberg (Germany), Mozarteum of Uruguay (Montevideo), Seoul National University (South Korea), National Conservatory of Music (Rio Gallegos, Patagonia, Argentina), Peruvian North American Cultural Institute, Lima (ICPNA), San Francisco Performances (USA), and the National Conservatory of Peru (Lima). Mr. Thompson has received commissions for original music from various institutions including California Shakespeare Festival(USA), Leo Kestenberg Musikschule (Germany), The San Francisco Conservatory of Music, and the Institute of Nano Science, Seoul National University (South Korea). He is a first prizewinner in the American String Teachers Association National Competition (ASTA). Currently, Mr. Thompson lives in California. In addition to performing, teaching, and composition, Mr. Thompson is a publisher of music. His Editions Ross Thompson Publications (ERT) printed music catalog includes over one thousand pages of original compositions and a discography of seven recordings. The entire catalog of printed music is available for download at http://issuu.com/ertpublications. His teaching style is characterized by a very supportive, humorous, and creative approach. Students receive vital technical direction while learning new work to perform from memory. Guitar study is comprehensive, including sight reading, harmonic analysis, musicianship practice, history, ensemble, and improvisation. His students have gone on to attend universities and conservatories including Harvard, Brown, and the San Francisco Conservatory of Music. The mission is to teach music so that it remains a staple of practice and performance throughout the lives of his students. Most recently he and concert flautist Natalia Kaminska-Palarczyk travelled to Korea for series of concerts in Seoul. The tour was sponsored by Seoul National University and will include a return to Korea in 2013 to debut a newly commissioned work for Flute, Kay gum, and Guitar. Highlights of the 2012-2013 seasons included a performance of his first symphony for orchestra, a work for guitars and strings dedicated to the San Francisco Conservatory of Music. In May of 2011 his Kestenberg Guitar Quartet was performed in Berlin at the Ibero-Amerikanisches Institut and the Festival of Contemporary Music (Original Töne Festival) (Musikschule Paul Hindemith).